1.After SparkPost account confirmation, login to your SparkPost account. 3. Add the domain name from which you want to send emails. 4. Click Add Domain button. 5. Add SPF record at DNS of the added sending domain name. Follow this host specific DNS update guide. 6. Add DKIM record at DNS of the added sending domain name. Follow this host specific DNS update guide. 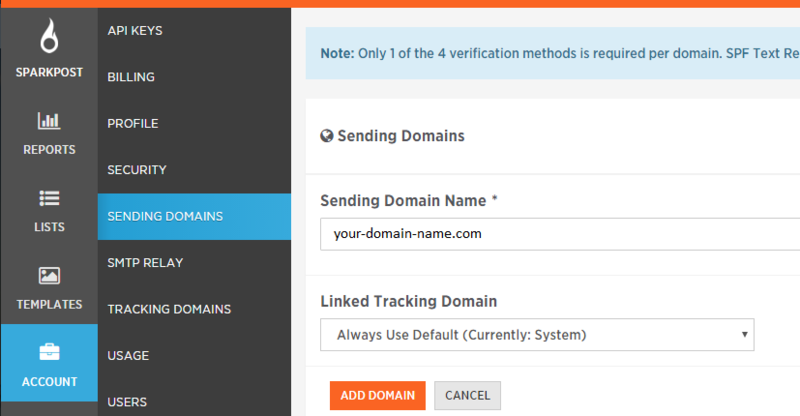 Note: Only 1 of the 4 verification methods is required per domain. SPF Text Record or DKIM Record is recommended for better deliverability. 7. Its a good practice to add abuse@ and postmaster@ emails on your sending email domains. Add these emails and verify the same. Note: If you are using Google Apps, you might not be able to create these emails, follow this tutorial. After this step, observer “Ready to Send” icon at right of added domain name and then, follow the next step of integration. 8. Create API at your SparkPost account. 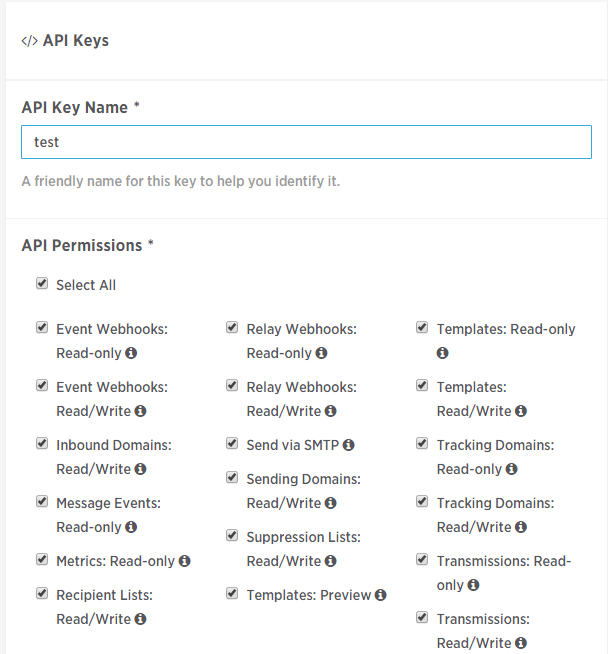 Go to SparkPost Dashboard > Account > Api Keys > Click “New API Key” button. 9. Now on next screen, give “API Key Name” and under API Permissions, click “Select All”. You can leave “Allowed IPs field blank. Finally, click “Add API Key” Button. 10. From next screen, copy the API key. 11. Now you are ready to use the domain name. From EasySendy Drip (or EasySendy Pro) Dashboard, go to Delivery Servers > Server Settings > Add SparkPost Web Api. On new screen add Name of the delivery server according to your convenience. 12. Add SparkPost API key from previous screen to EasySendy delivery server screen. Then, add “From Email”, “From Name” and finally, save the settings. 13. Now you need to validate your server, add an email address, where you can receive validation email. Followed by this, receive the validation email, and click on validation link from the email. 14. Confirm you have validated and activated the server in EasySendy Drip (or EasySendy Pro) delivery server dashboard. 15. After validation of SparkPost delivery server successfully completes, you can check SparkPost webhooks and confirm, if EasySendy Drip (or EasySendy Pro) bounce and complaint files are successfully added to your account. To check the given webhooks inside EasySendy Drip (or EasySendy Pro), go to delivery server > edit the server > click on “Info” tab from the right corner of the screen. In the new pop-up box, you will get the details about the webhooks and the EasySendy Drip (or EasySendy Pro) links. 16. You need to disable tracking in your SparkPost account, otherwise your open and click rate will have duplicate value inside email campaign report. Goto Account > SMTP RELAY > Engagement Tracking inside your SParkPost account. Then select Disable Tracking > Update Settings.